I’ve had a love for all things Disney my entire life! My first trip was in 2000 when I was 9 years old with my mom, grandparents, Aunt, Uncle and two cousins over Easter. I remember when my mom told me that we were going to go, I didn’t want to because I was too scared to get a plane. My family was able to talk me into going, and I’m so glad they did! I’ll never forget meeting my first character at Magic Kingdom (Br’er Fox), watching the fireworks, swimming, getting matching wallets with my cousins and taking turns riding in the wheelchair with my grandpa. My cousins and I got worried that the Easter Bunny wasn’t going to find us at Disney, but he did. And we even got the cleaning lady to sign our autograph book! Flash forward to 2014, when I needed to do an internship for my Travel & Tourism Degree. I am so thankful that Mouse Made Simple let me do it with them and they taught me so much! When my internship was over, they hired me on to be an agent and part of the office staff! 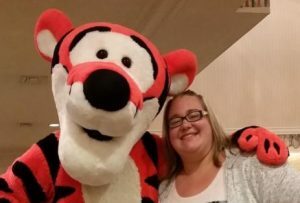 Some of my favorite things at Walt Disney World are riding Haunted Mansion, finding hidden Mickey’s, visiting all the different resorts (the Grand Floridian Resort is my favorite), meeting Tigger and especially the Mickey Premium Ice Cream Bars, plus more but the list would be too long! My favorite time of the year to go is either Fall or Winter. I have gone to both Mickey’s Not So Scary Halloween Party, Mickey’s Very Merry Christmas Party and Epcot’s International Food & Wine Festival. If I had to pick my favorite park, it would be Magic Kingdom. 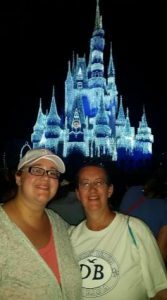 Seeing the castle brings tears to my eyes and there is nothing like seeing Magic Kingdom decorated for Christmas and seeing the castle lit up in Christmas Lights is something that you never forget. Walking down Main Street USA is my favorite walk! The citizens of Main Street are amazing and walking is the shops is a must do! When I’m not thinking about Disney (which is almost never) you can find me playing with my 3 rescue dogs or working at the local ice arena and watching hockey. I look forward to sharing my Disney knowledge with you to help you plan a magical vacation to help create memories that will last a lifetime.